When Marucci Bat aquired Vicuts most had one question: how would the asymmetric handle found on a lot of Vicuts bats be affected by the Marucci acquisition. Marucci and Axe compete in a lot of markets so would Marucci drive the ergonomic handle out of their line up? While that process still plays out in the majors, Axe continues to make new agreements with other MLB wood bat companies. Most recently, Tucci Lumber. We have covered the use of the Axe handle in a few of our articles. Our discussion with MLB pro bats using an Axe design as well as the history and theory behind an oval shaped handle. Check, too, our story on the acquisition of Victus by Marucci. Learn More about Tucci Bats.Learn More about Axe Bats. Here is the press release announcing the agreement. RENTON, Wash. (Nov. 30, 2017) – Axe Bat today announced a licensing agreement with Tucci Lumber Bat Company allowing Tucci to manufacture and sell wood baseball bats with the patented Axe Handle to professional players. Tucci Lumber, headquartered in Norwalk, Connecticut, is one of the top suppliers of bats to Big League players and counts All-Stars Troy Tulowitzki and Pablo Sandoval among its pro-player investors. Popularity of the Axe Handle among pro baseball players has grown exponentially since 2015. This year, at least three dozen Big Leaguers swung an Axe Handle bat during the regular season, including the championship series MVP and two starting all-stars. Two-time All-Star Mookie Betts is an endorser and has swung an Axe Handle bat exclusively since late 2015. Unlike a conventional round knob, the Axe Handle is engineered to support the biomechanics of the swing. Its shape conforms to the natural contours of a player’s wrist and palm, and enables a more efficient swing that maximizes bat speed and improves barrel control. Tucci Lumber is the third wood-bat manufacturer to sign a licensing deal with Axe Bat. Tucci was founded by Pete Tucci, a former first-round draft pick whose promising baseball career was derailed by a hand injury suffered while swinging a bat with an oversize round knob. 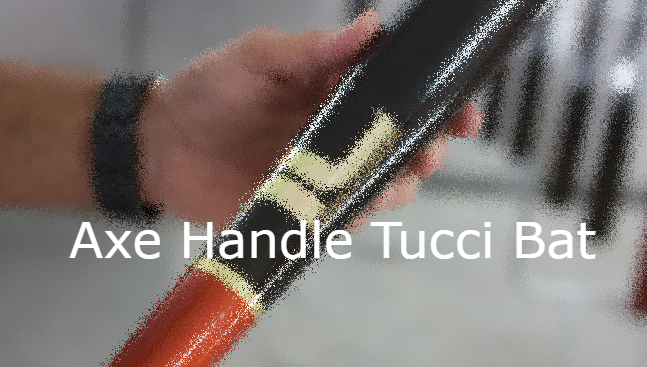 Tucci bats are known for their precision craftsmanship and high-quality finish, which includes a steel-burnishing process to increase hardness.